The area around Brooker , where the New River and the Santa Fe come together, would be a processing site & a transfer station, and as such will be perhaps the most heavily polluted site. New River feeds the Santa Fe which feeds the Suwannee. All 3 rivers would be heavily, significantly impacted. Air quality and environmental degradation from radon dust cannot be avoided. ​There is no protecting the groundwater and aquifer from containment pond leaching. Contrary to the industry claims , it is evident from the sinkhole development at phosphate mines that water is in fact travelling from the surface down to the aquifer. In late January of 2016, news broke that the four most prominent families of the Union/ Bradford area (Hazen, Howard, Pritchett, Shadd) had been designing a plan to mine phosphate on approximately 11,000 acres under the LLC of HPSII Phosphate. At the following County Commission meeting folks were standing in the hallways of the courthouse attempting to hear the proceedings. Shortly thereafter, a grassroots organization began to form. 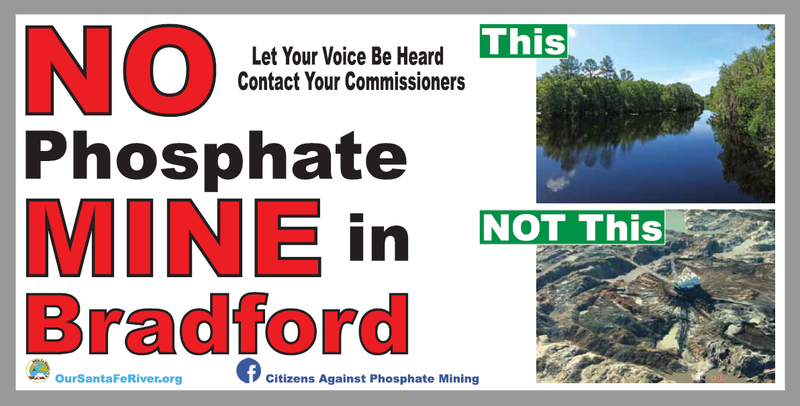 Citizens Against Phosphate Mining in Bradford and Union Counties (CAPM) began with a petition and a Facebook page. Soon, a small group of individuals was working as boots on the ground, making phone calls, papering the town in flyers, and even going door to door to spread the word and solicit support against the mine developed. When the next Union County meeting took place (approximately two weeks), they had garnered almost 3,000 signatures. The meeting lasted more than four hours with over 300 residents of both counties speaking out. Several local media outlets covered this unprecedented event. 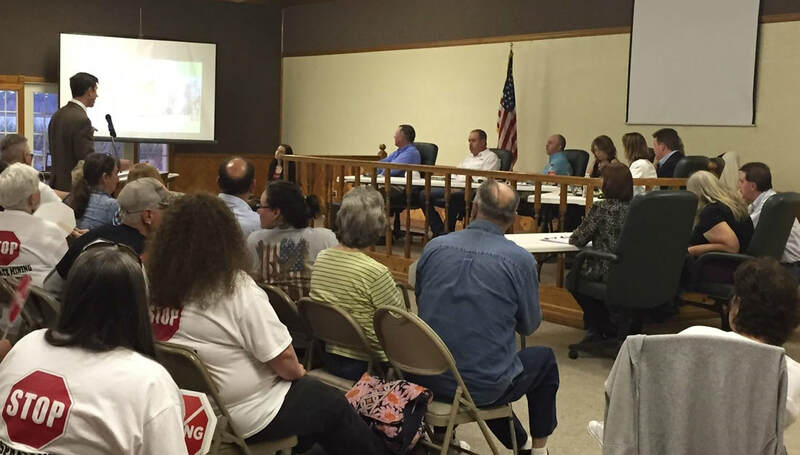 Slideshows were presented by both sides, and public comment was overwhelmingly in opposition to the proposed mining project. The concerns mentioned included, but were not limited to: noise, light, proximity to homes and waterways, radon dust, pollution, and water use. By the end of this meeting at the community center, with similar attendance, Union County Commissioners made a unanimous vote to enact a one year moratorium on mining (which was extended for another year in February 2017). This allowed the commissioners time to update the land development regulations (LDR’s) and the county comprehensive plan to properly address a project of such size and motivation. Thus, CAPM’s focus transferred over to Bradford County, which at that point, was believed to have not addressed this issue. Their Commission did not approve a moratorium, and a permit application was hastily submitted, freezing the LDRs in place. Bradford County BOCC meets at 9:30 am on the first Monday and 6:30pm on the third Thursday of every month at the Bradford County Courthouse. Union County BOCC meets at 6pm on the third Monday of every month at the Union County Courthouse. Florida has phosphate deposits near the surface, and they have been strip-mined as one of the three ingredients in commercial fertilizer. Everyone within earshot of the news has heard of the sinkhole that opened up under a waste mound and settling pond area of one of Mosaic’s mines in South Florida. The toxic byproducts, including radon, funneled into the aquifer for weeks while the responsible parties did nothing. Now they claim that if your well had not been tested prior to the spill, you can’t legally claim that it has been contaminated by this specific environmental disaster. 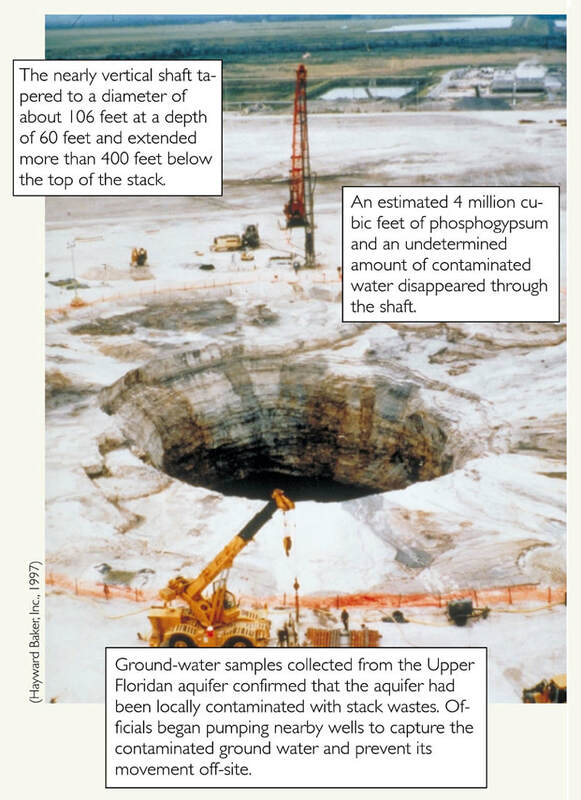 Phosphate is found starting about 35 feet below the ground. First, the trees and plants are stripped away. 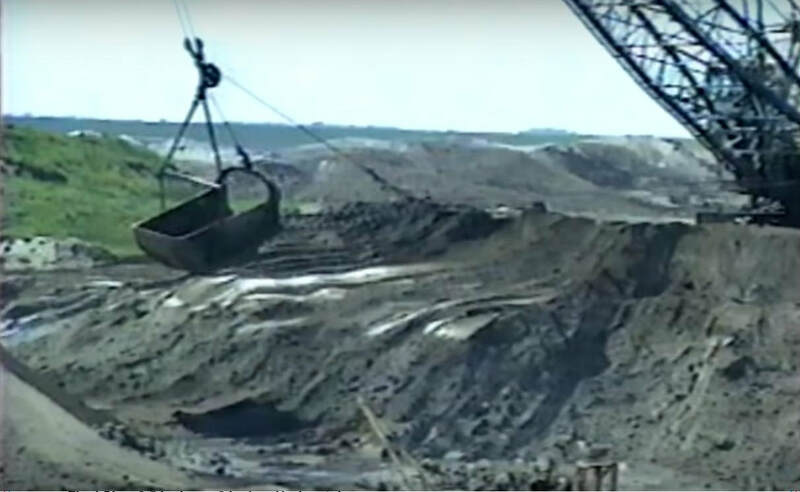 Then all the topsoil (“overburden”) is removed by large digging machines called “draglines” that excavate about 215 feet wide swaths at a time. Overburden includes remaining vegetation and wildlife habitat. This conglomerate is piled up and held for replacement at the end. The same method is used to dig deeper for the phosphate rock, a mixture of sand, rock, and clay. The rock is extracted by strip-mining 200 to 400 acres at a time. Normally it is combined with thousands of gallons of water (“slurry”) and the phosphorous is extracted, leaving acidic water, sand and clay to be returned to the site. ​ Environmentalists cringe to read about this entire process, knowing this is one of the many ways humans are destroying our beautifully diverse biosphere, one industry, one road, one city at a time.